Just after 8 p.m. on Tuesday of last week, two cars collided on I-295. According to jacksonville.com, the accident occurred right around the Normandy Boulevard exit. Apparently, an SUV was changing lanes and ran into a car in the adjacent lane. Then, possibly due to an over correction, the SUV veered off the road, eventually running into a tree. The vehicle had three Jacksonville residents traveling in it; one was a five-year-old child. The child and one of the adults were wearing their seat belts, although the other passenger was not and was ejected from the vehicle. Despite that, all three in the SUV, as well as the driver of the other car, suffered only minor injuries and are expected to recover. It is common practice for most of us to look where we are going when we change lanes. But sometimes drivers fail to do this, and this kind of distracted, inattentive driving can, and often does, cause car accidents resulting in injury or death. 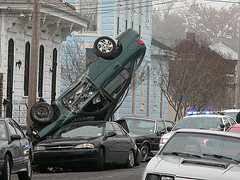 Unfortunately, Jacksonville is not immune to this type of auto accident. We are all aware that the law in Florida requires drivers follow the posted speed limits and obey all traffic laws. What you may not know is that, in addition to those basic requirements, the law also requires that all drivers exercise care in their driving, in hopes of decreasing the number of accidents like the one described above. In other words, drivers do not necessarily need to be speeding, or drunk, or breaking a traffic law to be “at fault” in an accident. In a suit against a party who caused an accident, it is sometimes enough to prove that the other driver was not taking the care and precaution that he or she should have. In the law, this is called negligence. The concept behind the law of negligence is fairly intuitive: if someone is not exercising the care they should in an activity (such as driving), and hurts someone or their property (by causing an accident), that person is responsible to the party they harmed. Proving negligence it court is more difficult and is best handled by an experienced accident attorney. Because nobody really intends to get into car wreck, most auto accident lawsuits are based on negligence, meaning it was not intentional. Proving negligence is complicated. There are four requirements that must be demonstrated: duty of care, breach of duty, causation, and damages. In most auto accidents, causation is the biggest point of contention. The defending attorney will likely argue that his or her client did not cause the plaintiff’s injuries, or that the plaintiff was responsible for his or her own injuries. Another common dispute is breach of care. The defendant’s counsel may argue that their client did not breach their duty of care, meaning that the defendant did not breach their responsibility to drive safely, such as disobeying or ignoring a traffic sign or signal. All of these scenarios illustrate the importance of having a skilled and experienced auto accident attorney on your side. If you or a loved one has been involved in an accident that you believe to be the fault of another driver’s negligence, you may be entitled to monetary compensation. To find out, give one of our experienced accident attorneys a call. At your convenience, we can discuss your situation and help you determine if it is in your best interest to bring a case. And remember, because we don’t bill you unless we make a recovery for you, there is no risk in calling.